Volunteers from Church of the Palms and Dove of the Desert UMC ( 14 thus far) are continuing to travel weekly to the host church in Tolleson (about 20 minutes away) where 150 asylum seekers are dropped off each Monday and Tuesday. We sort clothing to provide a clean set of clothes after the visitors have had a shower – usually their first in several days. We also package snack items for onward travel which are given to each traveler. On occasion, we will help serve a meal. Drivers from our church use the church bus to take groups to the bus depot or airport for their onward travel. We do whatever is needed. As you may recall, from last month’s article, the hosting church has a very small space in which to welcome 100 people. One of the things on their “wish list” was a large tent in which they could feed the visitors, and offer some protection from extreme heat and cold. We wrote a grant to the national United Church of Christ offices for assistance in paying for such a purchase. 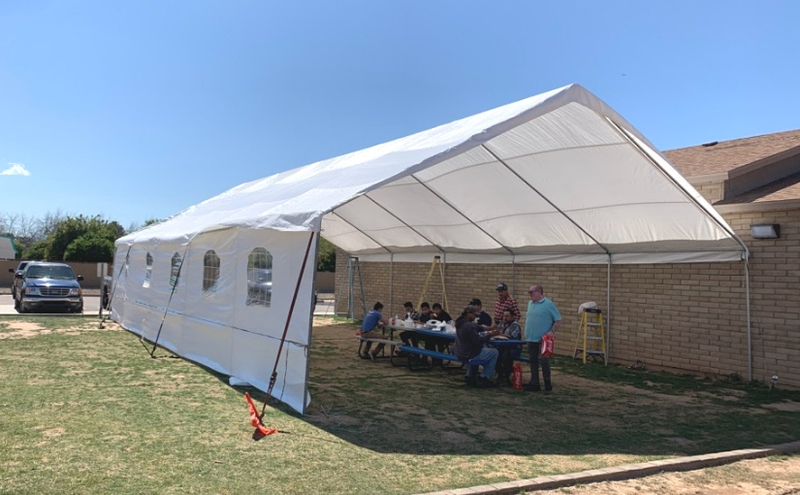 The grant was funded and a 30’x50’ tent has now been erected in back of the smaller building. As our friend Daoud Nassar from Tent of Nations outside of Bethlehem in the West Bank of Palestine says: “The road seeking justice for all is a long one.” There is no guarantee that we will see the end of the road, only that God will walk with us.